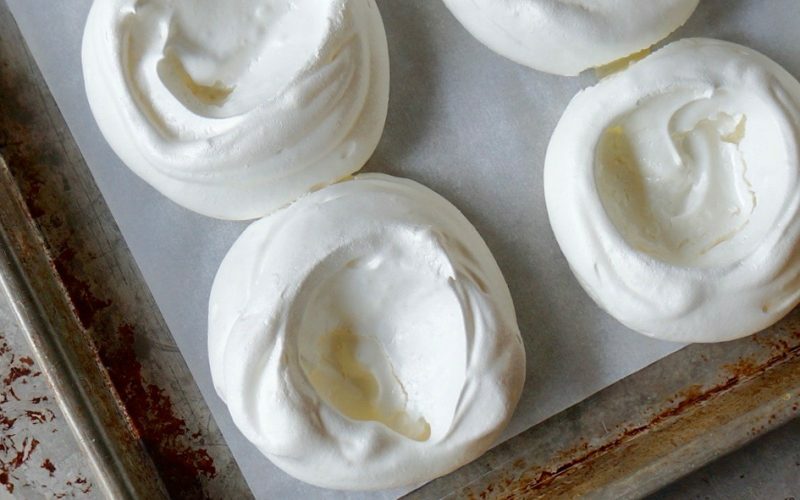 Meringue Shells can be used for a number of delicious dessert combinations. No more than beaten egg whites sweetened with a little sugar, the mixture is piped over parchment paper & then an indentation formed in the center. Once baked, the crisp morsel can be filled with all sorts of homemade fillings, jams, Vanilla Pastry Cream & fresh fruit then crowned with a generous finale of Chantilly Cream & fresh mint for a lovely presentation. Learn how to make a versatile dessert base perfect for an array of spring gatherings. Preheat the oven to 225 degrees. Line a half sheet pan with parchment paper. 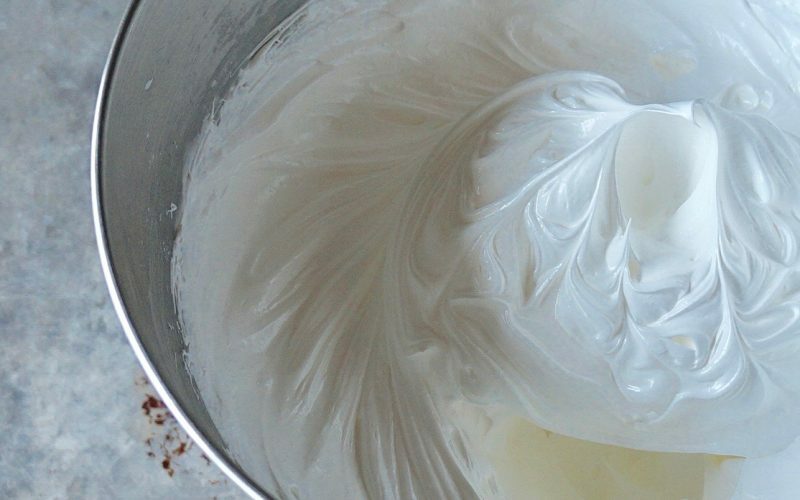 Beat the egg whites in the work bowl of an electric stand mixer on High until soft peaks form. Gradually add the sugar in a slow, steady stream & beat until stiff peaks form. The peaks will hold their shape with a graceful curve towards the tip in the spot where the whip attachment was lifted. Beat in the cornstarch & the salt. The entire process will take anywhere from 3 to 5 minutes. The final mixture will be bright white & glossy. 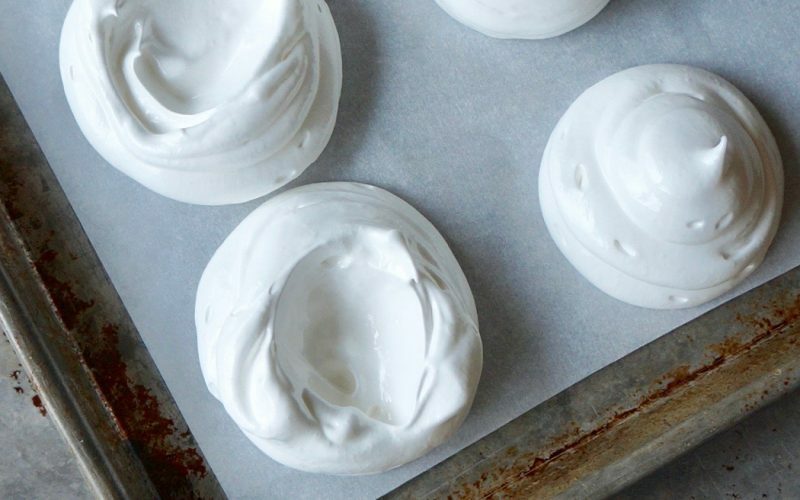 Meringue Shells can be prepared up to a day ahead of time when entertaining & are best served when humidity is low. They are an ideal dessert to offer guests in the spring when fresh seasonal fruit is beginning to emerge. Leave them on the pan once removed from the oven, allow to cool & place on the countertop, uncovered. When ready to assemble desserts, gently peel them from the parchment paper, place on plates & fill with desired items. Preheat the oven to 225 degrees. Line a half sheet pan with parchment paper. Look to The Basics: Eggs for pointers on separating the yolk & the white. 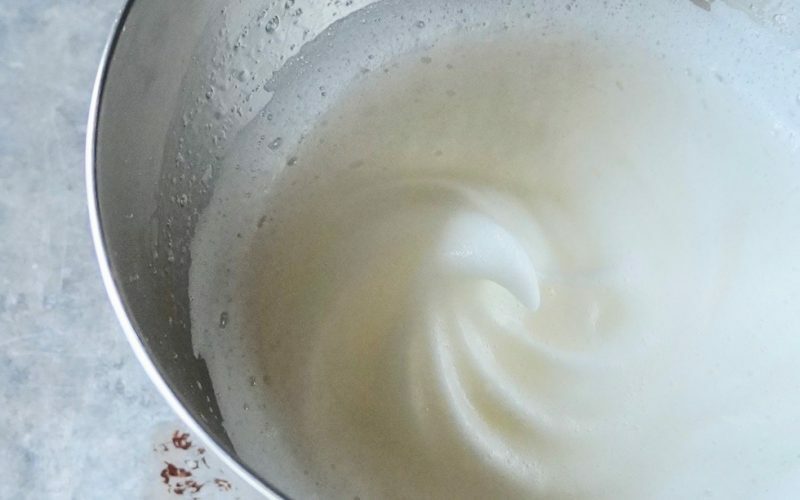 Beat the egg whites in the work bowl of an electric stand mixer on High until soft peaks form. The peaks should droop & curve. 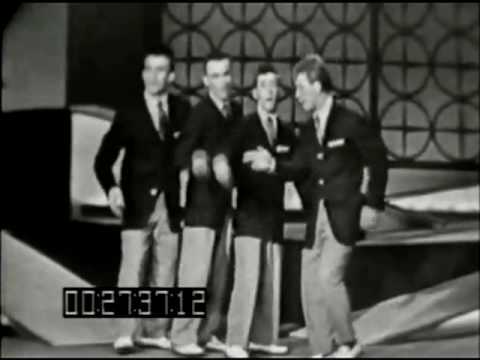 In order to reach maximum volume, do not be tempted to begin adding the sugar before this visual cue has been met. Gradually add the sugar in a slow, steady stream & beat until stiff peaks form. The peaks will hold their shape with a graceful curve towards the tip in the spot where the whip attachment was lifted. Beat in the cornstarch & the salt. The entire process will take anywhere from 3 to 5 minutes. The final mixture will be bright white, glossy & somewhat firm. Fill a piping bag with the mixture that is fit with an Ateco #9807 large plain tip. Pipe 2 1/2-inch mounds that measure approximately 2-inches high onto the prepared sheet pan. Refill the piping bag as necessary until all of the mixture has been portioned. Make an indentation in the center of each dollop using the back of a spoon to form a shell & remove any excess, if necessary. Bake on the center rack in the oven 1 1/2 hours. Turn off the oven & do open the door. Allow the pan to stand in the oven for 2 hours. Cool completely. 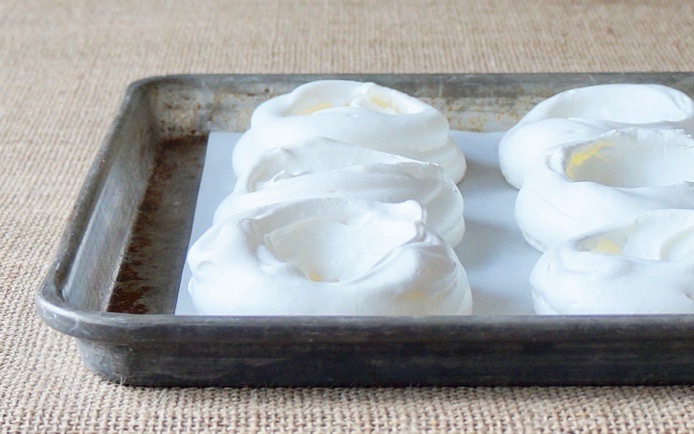 The meringue shells may crack in a few spots where the spoon was used to thin & make the indentation. This is normal. It will be covered with fillings & fruit for presentation.